This is one in a series of blogs providing tips to secure Airport Transportation for travelers from the city they live or work in every day to Philadelphia International Airport or one of a dozen other public and private airports across the tri-state area. Are you looking to book Airport Transportation to Philadelphia International Airport? Are you looking to book Airport Transportation to Newark Airport, JFK or one of a dozen other airports both public and private across the tri-state area? If so, simply call KSTG today at 610-222-6225 and let the best concierges in the industry arrange all of your transportation. Airport Transportation can be stressful for business and social travelers. Here at Kevin Smith Transportation Group, we thought we would write a blog that helped address those challenges. Below you find helpful tips for when you arrive at your destination, a list of possible airports to use from the Norristown, PA area and even some popular Chauffeured vehicle options you can choose from. Travel begins from the minute you leave your home or office and doesn’t end until you return. This blog is intended to make your first mile and last mile of your travel just a little bit easier. At 26.6 miles, Norristown to PHL can be a long ride depending upon the time of day. While many people make the drive themselves, fighting traffic, parking and overall congestion, the best solution is a Chauffeured driven ride with a professional company, providing a stress-free ride to start your travel. After a long business trip or even a fun vacation, the last thing anybody wants to do is fight the traffic back home from PHL to Norristown. By having a Chauffeur waiting for you at baggage claim, you can quickly leave the airport and head home, knowing you can sit and relax for the last miles of your journey home. When using Airport Transportation from Norristown, PA to Philadelphia International Airport, your final destination could be anywhere across the United States or across the world. To assist you on your travels, we have put together 5 general travel tips to make your travels better. Test your backpack before you go – Be honest with yourself. Not everyone is a great packer. Before planning on spending the day lugging around an over-packed backpack, test it at home to make sure it is comfortable. Shar your itinerary – Whenever you travel, make sure friends or family know your plans. Besides the aspect of them knowing where you are if they need you, from a safety perspective, they also would know where to look if for some reason you fell off the grid. Don’t exchange currency at the airport – The worst exchange rates are at the airport. Wait until you get closer to your final destination before handling this function. NO internet doesn’t mean panic – If you don’t have any internet for some reason, consider reading a book or hanging in the lobby or just doing some more exploring. Embrace the disconnect and see what you can discover. Wear flip-flops in the shower – If traveling on a budget and staying in a hostel, protect your feet and wear flip-flops. Probably not an issue if you are staying at the Four Seasons, however! These luxury vehicles are perfect for individuals up to groups of 4 people who are looking for Airport Transportation from Norristown, PA to Philadelphia International Airport or from Philadelphia International Airport back to Norristown, PA. These vehicles are perfect for companies and families traveling from Norristown, PA to Philadelphia International Airport. They can handle groups as large as 30 and provide a comfortable and safe way to travel to and from Norristown, PA to the Philadelphia International Airport. This grouping of vehicles covers the cool, a Stretch Limousine, and the efficient, a Coach Bus, that provides effective transportation for those who need Airport Transportation from Norristown, PA to Philadelphia International Airport. Many individuals and companies require Airport Transportation from Norristown, PA to airports across the tri-state area. 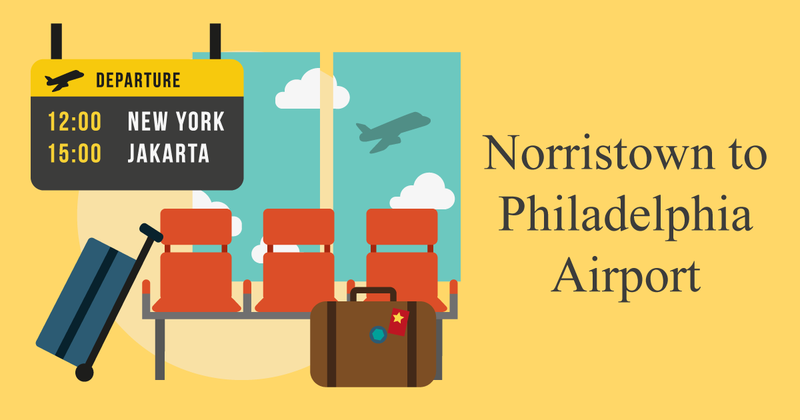 Here are the top 14 most common airports that people from Norristown, PA fly out of. I’m not sure we will make your Airport Transportation fun but maybe, we can make it a little bit easier for you. If you found this blog helpful, visit our Blog Page for more insight as we cover a variety of topics in our continuing blog series including Corporate Travel, Wedding Planning and Party Bus destinations. For any transportation needs, please call Kevin Smith Transportation Group at 610-222-6225 and one of our Concierges will help you arrange all of the details.